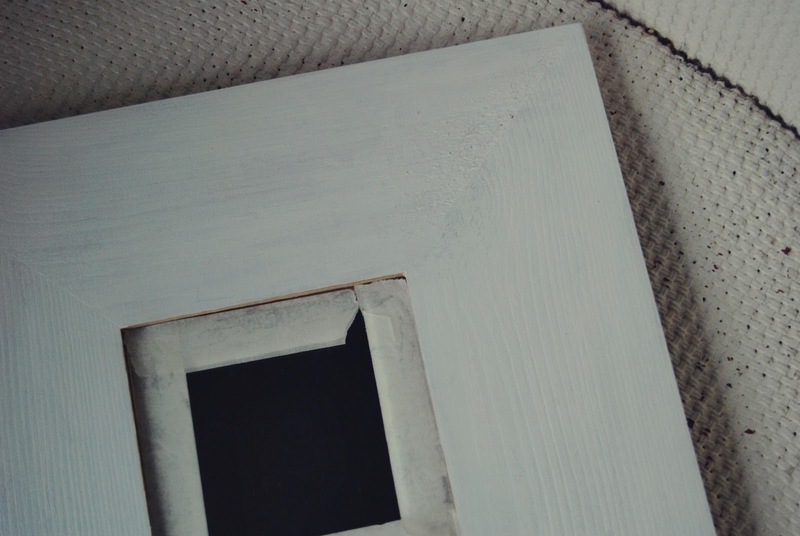 Apply some masking tape to the inside border of your mirror to avoid getting paint on the mirror itself; then paint a base coat in white - this will help the second gold coat stand out. 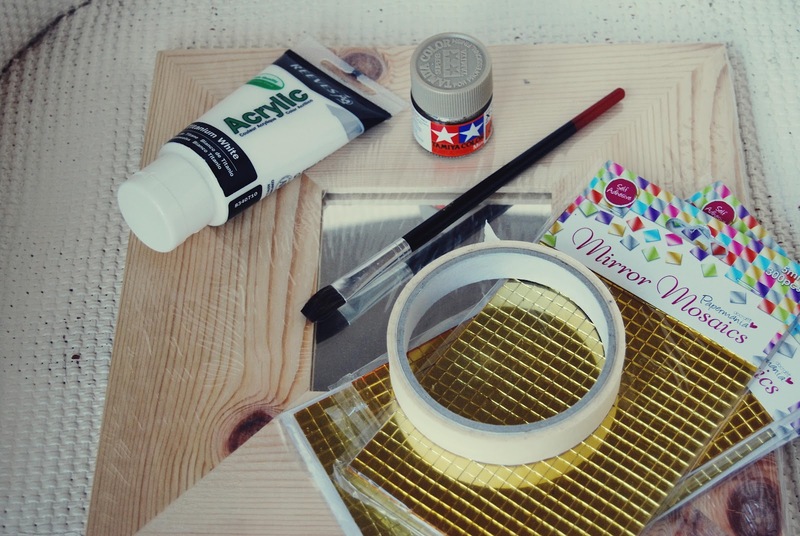 Paint your second coat in gold. I did this so that the gaps between your mosaic pieces will blend better with the gold mirror. Start sticking your mosaic pieces! You can do this in any way you like - you can be as neat or as random as you like with the pieces. It takes a little while, so be patient. Finished! 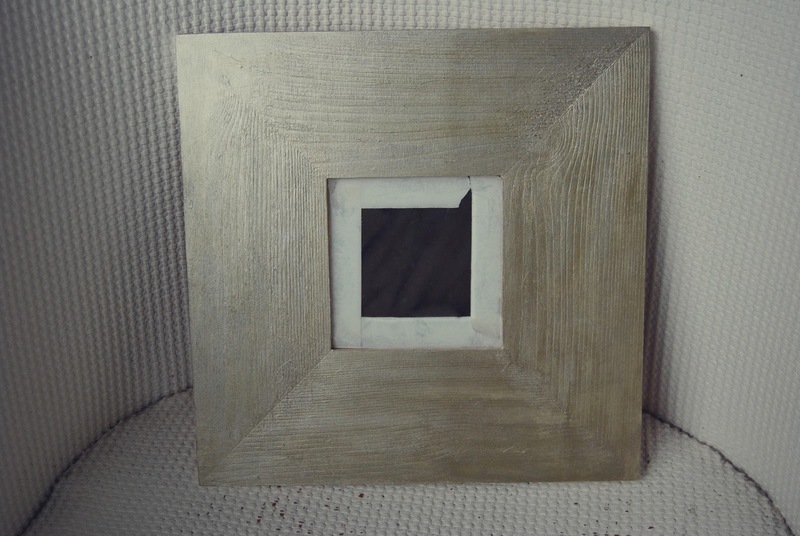 Now hang your shiny new mirror somewhere everyone can see, or prop it up on a ledge or mantlepiece. Either way it's bound to brighten up a dull space. If you give this project a go, I'd love to see your results - leave a link in the comments below. I love this DIY, the end result looks so good! That does look really pretty - how long did it take to still all those squares on?! It took a while. I casually stuck them on whilst watching TV, so I probably could have done it faster. 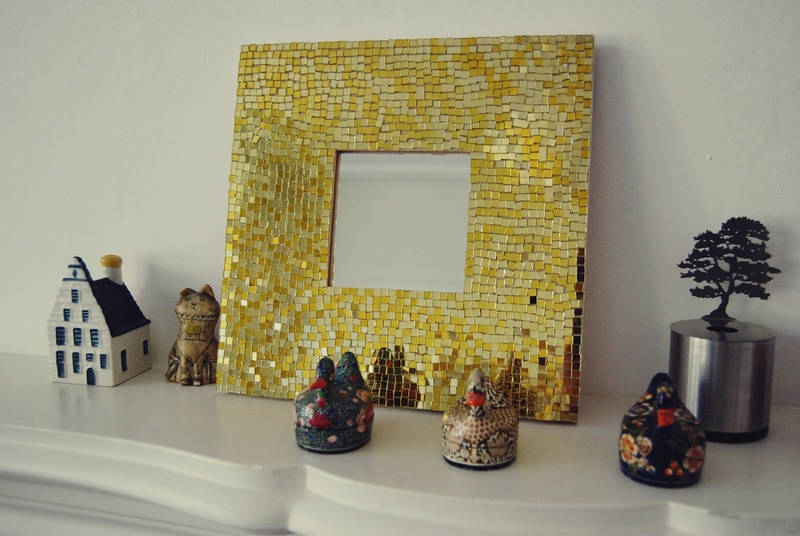 Where did you purchase the mirror mosaic pieces? Also, they look like a self adhesive type, is that accurate? I got them in Hobby Craft, but I've seen that you can buy them from Amazon.com as well. They are self-adhesive so you don't need to mess around with any glue. Thank you for the birthday wishes :) This looks great, I've never seen this type of mosaic tiles around here. wow!! This looks so great! What a lovely idea! I'd love to try it out with a round mirror that I've been wanting. Interestingly, I have a little round mirror with mirror mosaics in a pattern around the mirror! It's been lying packed up since I moved....2 years ago....I must go dig it out! It's a beautiful mirror by the way! Thanks Melanie. If you follow the link to Amazon.co.uk you can buy them there. Follow the link to the sellers international rates for postage costs to the US. Thank you SO much!! I can't wait to get started! No problem. I'd love to see your version - leave a link if you want when it's done, but no worries if you'd rather not. I would post a link but I don't think I'll be making it! "/ I tried to buy the stickers but it's just too expensive to have them shipped to the US. It's about 27 USD. :( Maybe one day I won't be so frugal and I'll buy them! Thanks again! I hope you were able to find them over the last few years. If not, I believe I have seen something similar in the dollar stores, where I live, here in Canada. I bet you could even find them on eBay as well (many sellers even offer free shipping)! This is stunning! It looks so elegant and expensive, great job! Thanks for the great idea! I will be making my own version eventually. I think one could cut up and use the sheets of super thin glitzy tiles I keep seeing in tile stores and home improvement stores for making this. They are wafer thin, but for accents when tiling walls in kitchens and baths, and come in pretty glitzy metallic iridescent colors. They could be glued on with craft glue. They come in little strips and squares. They are not ceramic or glass. I'm looking for an example so I can post a link but haven't found them online yet. I guess I'm just not using the best search terms. They are sold in 1 ft. square sheets in the same area as other mosaic wall tiles at Lowes or Home Depot and in the tile stores I have been to in the last year. I think they are laminated plastic or some super-thin composite. As I remember, they are like 1/8" thick or less. If I can find a link to an example, I'll come back and post it here. Hi Patty, that's a really good idea - I'd not thought of using those before. If you end up making one with this material I'd love to see. Leave a link here if you do. Thanks, Lois! I finally went to Lowes just to look at the ones I was thinking of and they are actually thing strips of glass that are only 1/16" thick or so. 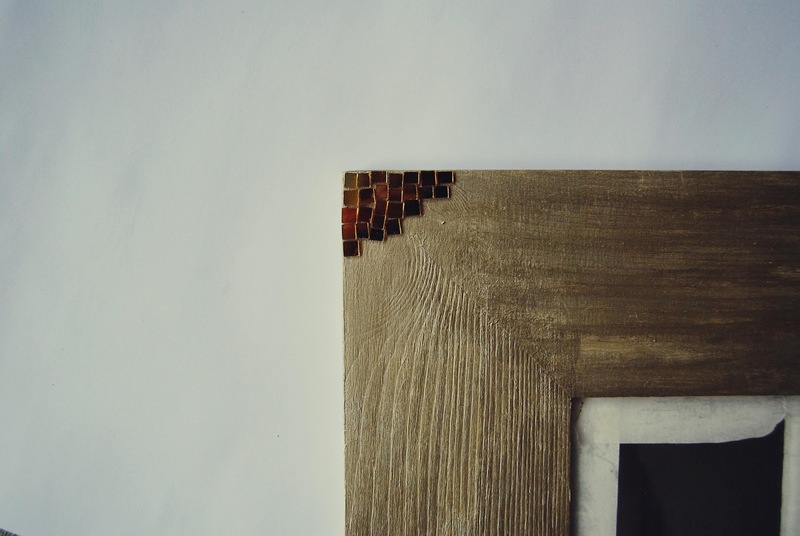 If you want to cut them smaller, they do require a glass scoring and cutting tool that has two opposing scoring wheels, then you snap the glass apart, or you can use a wet saw to cut them. That may be more that some people would want to take on, but probably worth the effort. I have a wet saw, but will probably buy the hand tool too. One can also buy that newer epoxy type grout (Mapei or Laticrete, I forget which) in tubes (like caulk comes in) at some retailers if that's the look one wants. The project would have to be waterproof to use that. One could create the design without grout, placing the tiles very close together, or make fake grout with paint and sand or some other combination. Your project with the adhesive mosaics is a lot easier though! See? I am still thinking about your inspiring project! Can you see the virtual smoke coming from my ears? Thanks again for the tutorial! It may be a long time before I get this done, but I will upload a pic when I do. I spent an unhealthy amount of time today, while I was driving, thinking about how you would be sure that they all lined up at the corners. It like became a little obsessive. Thank you for taking the time to comment - it makes my day! Hi I'm Lois. I make things, take pictures and try to continually improve my life and self through the things I enjoy.